Renal oncocytomas (ROs) are benign epithelial tumors of the kidney whereas chromophobe renal cell carcinoma (chRCCs) are malignant renal tumors. The latter constitute 5–7% of renal neoplasias. ROs and chRCCs show pronounced molecular and histological similarities, which renders their differentiation demanding. We aimed for the differential proteome profiling of ROs and early-stage chRCCs in order to better understand distinguishing protein patterns. We employed formalin-fixed, paraffin-embedded samples (six RO cases, six chRCC cases) together with isotopic triplex dimethylation and a pooled reference standard to enable cohort-wide quantitative comparison. For lysosomal-associated membrane protein 1 (LAMP1) and integrin alpha-V (ITGAV) we performed corroborative immunohistochemistry (IHC) in an extended cohort of 42 RO cases and 31 chRCC cases. At 1% false discovery rate, we identified > 3900 proteins, of which > 2400 proteins were consistently quantified in at least four RO and four chRCC cases. The proteomic expression profiling discriminated ROs and chRCCs and highlighted established features such as accumulation of mitochondrial proteins in ROs together with emphasizing the accumulation of endo-lysosomal proteins in chRCCs. 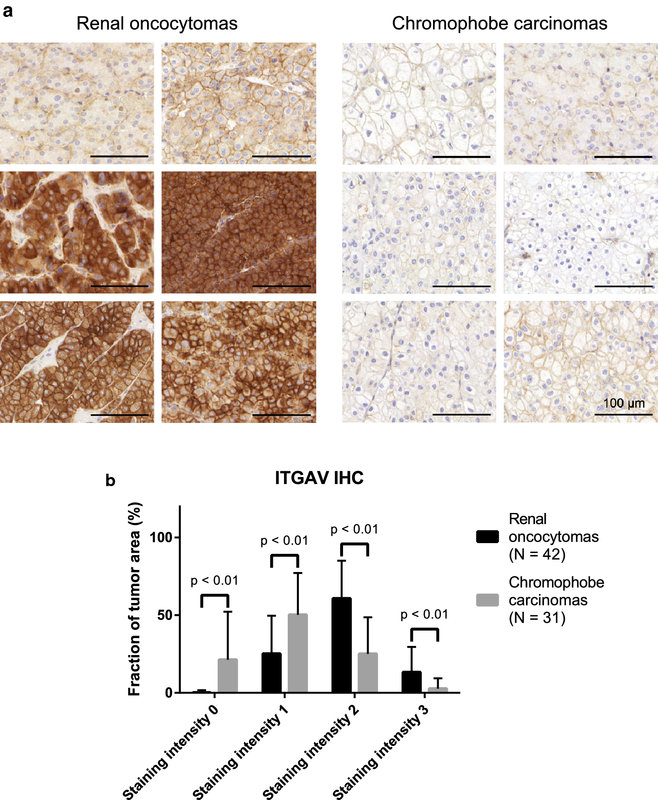 In line with the proteomic data, IHC showed enrichment of LAMP1 in chRCC and of ITGAV in RO. We present one of the first differential proteome profiling studies on ROs and chRCCs and highlight differential abundance of LAMP1 and ITGAV in these renal tumors. Chromophobe renal cell carcinoma (chRCC) constitute 5–7% of renal neoplasias . ChRCC are thought to originate from cell of the distal nephron . Their overall prognosis is more favourable than for renal clear cell carcinomas with a 5-year survival rate of > 75% [1, 3]. However, this is still a malignant tumor entity with the potential for recurrence or metastatic spread. Renal oncocytomas (ROs) are benign epithelial tumors of the kidney. They constitute up to 7% of all adult renal tumors . ROs have been first described as late as 1942  and clinical reports have remained scarce until the 1970s . Differentiation between RO and chRCC in pathological routine practice is often considered challenging [4, 7]. This is because of strong similarities in morphology, growth pattern and localization of benign ROs and malignant chRCCs. For this reason, distinguishing biomarkers are actively being researched. In this context, system-wide, omics-type expression profiling studies are emerging as a strong and unbiased approach. Several of such expression studies aimed at a comprehensive differential profiling of various renal cell tumors, also including clear cell renal cell carcinoma (ccRCCs) or papillary renal cell carcinoma. Often, such studies involved only low numbers of RO and chRCC cases and aimed at their collective distinction from other renal cell tumors rather than molecularly distinguishing ROs and chRCCs. Yusenko et al. probed genome alterations and DNA copy number variants to specifically differentiate ROs and chRCCs. They identified several genomic alterations that differ between chRCCs and ROs . A second genomic study identified differing chromosomal abnormalities with regard to chromosome 19 in ROs or chRCCs . The resulting gene expression effects affected oxygen sensing. This is an intriguing parallel to ccRCCs which frequently carry somatic, inactivating mutations of the Von Hippel-Lindau gene, ultimately leading to the expression of hypoxia-related genes and promotion of tumorigenesis . On the genomic level, Joshi et al. distinguish two types of ROs and link chromosomal abnormalities involving chromosome 1, X or Y, and/or 14 and 21 with the potential for progression from RO to chRCC. Rohan et al. performed a global transcriptomic profiling of ROs and chRCCs. Major expression differences were found with regard to transcript encoding proteins involved in vesicular transport and cell junction. On the protein level, multiple protein biomarkers have been suggested (reviewed in ) but to date there has not been an unbiased, differential proteomic profiling of ROs and chRCCs. However, proteomic profiling is gaining interest for the investigation of malignancies due to the limited correlation between mRNA and protein levels [13, 14]. Formalin-fixed, paraffin-embedded (FFPE) samples are a valuable resource for proteomic profiling [15–17], enabling retrospective profiling of clinic-pathologically annotated specimens [18, 19]. In the present study, we employed “FFPE proteomics” for the differential proteomic profiling of RO and chRCC cases for which we find noticeable differences. In a larger cohort comprising > 70 RO and chRCC cases, we corroborate elevated presence of lysosomal-associated membrane protein 1 in chRCCs and elevated presence of integrin alpha-V in ROs. The study was approved by the Ethics Committee of the University Medical Center Freiburg (311/12). Before study inclusion, all patient data were anonymized. The diagnosis for all RO or chRCC cases used in this study was based on histopathologic parameters (cytoplasm, cell membrane, perinuclear halo, tumor border and septae) and corroborated by immunohistochemistry (IHC) for CD117, cytokeratin-7, and vimentin. These IHC stainings were part of the routine immunohistopathological diagnosis with the corresponding antibodies being supplied by Dako (Hamburg, Germany). We focused on chRCC cases that displayed diffuse-membranous expression of cytokeratin-7 whereas its expression was largely absent in the RO cases [1, 7]. Moreover, the RO and chRCC cases displayed membranous expression of CD117 . Finally, the RO and chRCC cases were vimentin-negative . FFPE tissue specimens of six ROs and six chRCCs were used as described previously [15, 19], including microscopically controlled macrodissection to remove areas of necrosis, fibrosis, hemorrhage, and inflammation. For quantitative comparison, triplex isotopic dimethylation of primary amines was employed , distinguishing RO, chRCC, and a pooled mix that serves as a standard similar to the Super-SILAC approach . Samples were further fractionated by strong cation exchange chromatography as described . LC–MS/MS was performed using a Q-Exactive plus (Thermo Scientific) mass spectrometer coupled to an Easy nanoLC 1000 (Thermo Scientific) as described previously . MS data were analyzed by MaxQuant version 1.5.28  as described previously . Proteins were only further considered if they were identified and quantified in at least four RO samples and four chRCC samples. Due to this strict requirement, we also included proteins that were identified and quantified by single peptides in individual samples. Files obtained by MaxQuant were further processed using RStudio v.0.99.446 (R Foundation for Statistical Computing, Vienna, Austria) as previously described . Reverse and potential contaminants entries were removed. Ratios were log2 transformed, normalized by centering, and a linear model was fitted using the limma package . IHC analysis was performed with an extended patient cohort, comprising 42 RO cases and 31 chRCC cases. IHC was performed for lysosomal-associated membrane protein 1 (LAMP1) and integrin alpha-V (ITGAV). Slices of 2 µm thickness from FFPE tissue samples were prepared using a Leica RM2255 microtome. Heat induced antigen retrieval was performed at pH 9.0. Primary antibodies were rabbit polyclonal to LAMP1 (Abcam, ab24170, stock concentration 1.0 mg/ml) or rabbit monoclonal to ITGAV (Abcam, EPR16800, stock concentration 1.0 mg/ml). For incubation, primary antibodies were diluted in Zytomed dilution buffer (ZUC025-500; 1:300 for the LAMP1 antibody, 1:7000 for the ITGAV antibody). Incubation time was 60 min. Visualization was performed using DAKO Envision Flex+, Mouse, high pH (Link) Detecting System (K800221-2). Sections were counterstained with hematoxylin for 1 min, dehydrated in an ascending alcohol concentration and covered with xylol and coverslipping film (Tissue-TekR 4770). For evaluation, two experienced pathologists reviewed LAMP1 and ITGAV expression in RO or chRCC tumor cells using a semi-quantitative scoring system covering absence of signal (score 0), weak detection (score 1), medium detection (score 2), and strong detection (score 3). For every sample, the fractional area of the different detection levels (scores 0–3) was determined and reported as percentage of the total tumor area under investigation. We aimed for a differential, quantitative proteome characterization of RO and chRCC using FFPE samples for which we have shown amenability to quantitative proteomic analysis using isotope-coded dimethylation . Our cohort for the proteomic analysis comprised 12 cases; six RO and six chRCC. In order to enable cohort-wide comparison, we also included a pooled sample (comprised of RO and chRCC tissue) as a spike-in reference standard against which every other sample can be compared. This set-up is reminiscent of the Super-SILAC technique, in which metabolically labelled proteomes serve as spike-in reference standard . A triplex labeling scheme was employed (Fig. 1a, actual labeling setup in Additional file 1: Table S1). In a second cohort (42 RO cases; 31 chRCC cases) we employed immunohistochemistry to probe the expression of LAMP1 and ITGAV. Since the benign oncocytomas are very rarely invasive (which constitutes their benign nature), we focused on chRCC cases for which tumor growth was still confined to the kidney (T1 or T2). An overview of the patient characteristics is provided in Table 1. LC–MS/MS analysis enabled the identification (at a false discovery rate < 1%) of > 3900 proteins. Of these, > 2400 proteins were identified and quantified in at least four RO and four chRCC cases. Within this “core proteome”, each case allowed for the identification and quantification of a comparable number of proteins (Fig. 1b). Likewise, the protein quantitation profiles (log-transformed sample/standard ratios) are similar (Fig. 1b). We conclude that proteome coverage and—quantitation allows for the comparison of the RO and chRCC proteome profiles. We employed partial least squares discriminant analysis (PLS-DA) as an initial step to probe whether RO and chRCC display distinguishable proteome profiles. Supervised PLS-DA of the proteomic dataset (Fig. 1c) clearly separates RO and chRCC in an unbiased manner, thus corroborating their initial distinction. Noteworthy, RO and chRCC were primarily distinguished by histopathological parameters and cytokeratin-7 IHC as part of routine diagnosis. Further approaches such as S100A1 IHC or Hale colloidal iron staining  have not been routinely employed, which however is not meant to question their discriminatory power. To identify proteins that are significantly enriched in either RO or chRCC (as compared to the pooled standard), we employed a linear model as implemented in the limma statistical package , which is particularly powerful with regard to multiple testing correction and prevention of false-positive discoveries in the analysis of omics-style data. We consider proteins with a limma moderated p value < 0.01 and protein identification based on at least three peptide-spectrum-matches to be significantly enriched in either RO or chRCC (as compared to the pooled standard). These criteria resulted in 51 proteins being significantly enriched in RO tissue and 59 proteins being significantly enriched in chRCC tissue (Tables 2 and 3). The corresponding volcano plot is visualized in Fig. 2a; all limma moderated p-values and average log2 ratios are listed in Additional file 2: Table S2. In line with earlier reports [1, 7] and our IHC-assisted confirmation of RO or chRCC diagnosis, there was significant enrichment of cytokeratin-7 in the chRCC cases (p ≪ 0.01). In order to classify the differentially regulated proteins in RO or chRCC tissue, we performed a gene ontology (GO) enrichment analysis, with a focus on the “cellular compartment” annotation [27, 28]. We chose the TopGO algorithm to minimize GO term redundancy [29–31]. For RO tissue, this analysis points towards an enrichment of mitochondrial proteins whereas lysosomal proteins appear to be enriched in chRCC tissue (Fig. 2b). High abundance of—potentially respiration-defective—mitochondria has been previously named as a distinguishing feature of renal oncocytomas [11, 32, 33]. Likewise lysosomal defects have been identified as a hallmark of ROs . Likewise, an under-representation of endocytotic proteins in ROs has been reported  and the presence of vesicular proteins of the tetraspanin family has been proposed as a chRCC marker . We conclude that our proteome profiling reflects hallmark features of ROs and chRCCs. Lysosomal defects have been reported for ROs  but lysosomal marker proteins have not yet been used to distinguish ROs and chRCCs by IHC. In our proteomic dataset, we noticed significant enrichment of lysosome-associated membrane proteins (LAMPs) 1– 3 in chRCC (Table 3). Of these, we chose LAMP1 for IHC analysis in an extended cohort comprising 42 RO cases and 31 chRCC cases. Although LAMP-2 and -3 were even stronger enriched in chRCCs, we opted for LAMP-1 since we had previously probed LAMP-1 as a prototypical marker of lysosomal biology [35, 36]. Exemplary stainings are shown in Fig. 3a. In the RO cases, we noticed elevated levels of tumor cells with a heterogenous distribution of LAMP1, comprising single or multiple LAMP-1 clusters with focal or apical localization. In contrast, LAMP1 within chRCC tumor cells was often present in a diffuse cytosolic manner (Fig. 3a, b). Similarly different staining patterns (diffuse in chRCC; apical/polar in RO) have been previously reported for the related protein LAMP-3 (referred to as CD63 in the study) [4, 37]. In addition to the different localization, we used a semi-quantitative scoring system to evaluate the LAMP1 presence, covering absence of signal (score 0), weak detection (score 1), medium detection (score 2), and strong detection (score 3). For cells displaying heterogenous LAMP1 staining, the predominant staining intensity was considered; this typically being the weaker signal. Our analysis highlighted that ROs are characterized by weaker LAMP1 presence in contrast to the elevated LAMP1 presence in chRCCs (Fig. 3c). The IHC analysis thus corroborates the proteomic result. To assess a possible correlation of LAMP1 staining with clinical-pathological parameters of chRCC such as overall survival and T1–T4 staging, we are referring to data of the The Human Protein Atlas/Pathology Atlas [38, 39] since our cohort focuses on T1 and T2 stages. LAMP1 showed a tendency for shortened overall survival upon elevated expression but no correlation with tumor stage. Integrin biology has been rarely reported as a differentiating feature that discriminates RO and chRCC. In our proteomic data, we noticed significant enrichment of ITGAV in the RO cases, which we further investigated by IHC in the extended IHC cohort (see above). In good agreement with the proteomic data, there was comparably strong presence of ITGAV in the RO cases while ITGAV presence in chRCC was sparse (Fig. 4a). This was further corroborated by a semi-quantitative analysis (see above for details) of different staining ITGAV staining intensities and their fraction of the tumor area under investigation (Fig. 4b). Several transcriptome studies found comparable transcript levels of ITGAV, both when comparing RO and chRCC as well as when extending the comparison to other renal neoplasms [8, 12, 40, 41]. However, as previously outlined, there is increasing evidence that mRNA abundance and protein levels only display a limited correlation [13, 14], e.g. due to differential synthesis and degradation rates, thus emphasizing the importance of direct protein analysis by means of mass spectrometry or immuno-detection. To assess a possible correlation of ITGAV staining with clinical-pathological parameters of chRCC such as overall survival and T1–T4 staging, we are referring to data of the The Human Protein Atlas/Pathology Atlas [38, 39] since our cohort focuses on T1 and T2 stages. ITGAV showed a tendency for shortened overall survival upon elevated expression but no correlation with tumor stage. We present one of the first proteomic profiling studies to differentiate renal oncocytomas and chromophobe renal cell carcinomas. We found distinguishable proteome profiles, which reflect previously annotated, discriminating features of ROs and chRCCs. Moreover, we identified novel protein candidates for which differential expression between ROs and chRCCs has not yet been described. Using an extended cohort of > 70 RO and chRCC cases, we corroborate strong presence of ITGAV in RO and of LAMP1 in chRCC. Methodologically, our work further validates the robustness of using FFPE material for retrospective quantitative proteomics as a first step for differential marker identification. Extension to further variants of renal cell neoplasms  is an intriguing outlook. VD, MW, CAJ, OS conceived the study; BH, VD performed experiments; VD, BH, CS, LK, MW, CAJ, OS analysed data. All authors read and approved the final manuscript. Tissue sampling, archiving, annotation, and accessibility for the presented research was supported by the tumor biobank of the Comprehensive Cancer Center Freiburg (CCCF) and the German Cancer Consortium (DKTK), partner site Freiburg. The mass spectrometry proteomics data have been deposited to the ProteomeXchange Consortium via the PRIDE  partner repository with the dataset identifier PXD009300. Reviewer account details: Username: reviewer06581@ebi.ac.uk, Password: 0PRnXlya. OS acknowledges support by Deutsche Forschungsgemeinschaft (SCHI 871/5, SCHI 871/8, SCHI 871/9, SCHI 871/11, INST 39/900-1, and SFB850-Project Z1), the Excellence Initiative of the German Federal and State Governments (EXC 294, BIOSS), the European Research Council (PoC 780730, ProteaseNter), and the German-Israeli Foundation (Grant No. 1444). 12014_2018_9200_MOESM1_ESM.xlsx Additional file 1: Table S1. Labeling scheme setup. 12014_2018_9200_MOESM2_ESM.xlsx Additional file 2: Table S2. Overview of the > 2400 proteins were identified (false-discovery rate < 1%) and quantified in at least four RO and four chRCC samples.